Fordham University Press, 9780823231799, 210pp. This book records a major critic's three decades of thinking about the connection between literature and the conditions of people's lives-that is, politics. A preference for impurity and a search for how to analyze and explain it are guiding threads in this book as its chapters pursue the complex entanglements of culture, politics, and society from which great literature arises. At its core is the nineteenth-century novel, but it addresses a broader range of writers as well, in a textured, contoured, discontinuous history.The chapters stand out for a rare combination. They practice both an intensive close reading that does not demand unity as its goal and an attention to literature as a social institution, a source of values that are often created in its later reception rather than given at the outset. When addressing canonical writers-Shakespeare, Dickens, Twain, Keats, Melville, George Eliot, Flaubert, Baudelaire, and Ralph Ellison-the author never forgets that many of their texts, even Shakespeare's plays, were in their own time judged to be popular, commercial, minor, or even trashy. In drawing on these works as resources in politically charged arguments about value, the author pays close attention to the processes of posterity that validated these authors' greatness.Among those processes of posterity are the responses of other writers. In making their choices of style, subject, genre, and form, writers both draw from and differ from other writers of the past and of their own times. The critical thinking about other literature through which many great works construct their inventiveness reveals that criticism is not just a minor, secondary practice, segregated from the primary work of creativity.Participating in as well as analyzing that work of critical creativity, this volume is rich with important insights for all readers and teachers of literature. 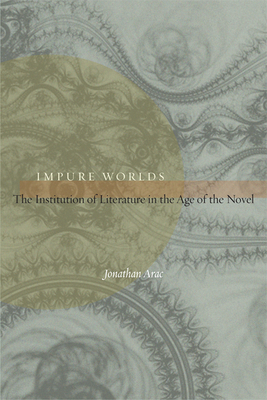 Jonathan Arac is Andrew W. Mellon Professor of English at the University of Pittsburgh. He is the author of many books, most recently The Emergence of American Literary Narrative, 1820-1860 and Huckleberry Finn as Idol and Target: The Functions of Criticism in Our Time.